"Read it in one glorious gulp - it's brilliant"
"I absolutely loved it. Very funny and very emotional"
"a brilliant piece of writing"
"I can't find a one act play, a one-hander, to get my teeth into" someone told me a few years ago. "Pity it's not written for a woman" was then a comment. So I wrote a female version. "Could it work about a different place?" was then the query? Big Al is taking a bus journey to Whitby. It is a journey he has waited his whole life to take. He is an innocent abroad and clearly, an innocent to so much more. During his trip he speaks to an unseen fellow passenger about his journey and unsurprisingly, as is the case with so many passengers, he talks about more than the view. As his journey twists and turns, so do his disclosures and eventually, the reason for it is laid bare, as is his life and his plans for it. 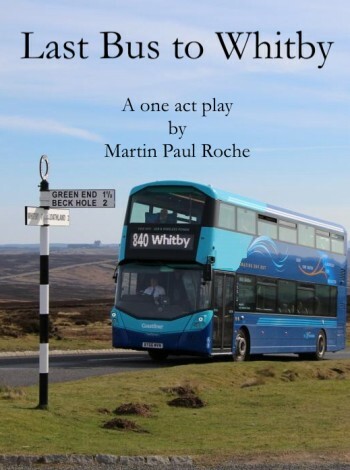 Last Bus to Whitby is a play about resonance and honesty with oneself; about finding peace. It explores in a gentle, innocent and bygone way, how happiness and self-fulfilment, do not, for some, require other people or wealth to make them a reality. All it sometimes needs is a stranger to listen and the opportunity to talk. But life’s journey sometimes hands us the most unexpected of opportunities to find our own perfect moment and within it, much needed clarity and peace of mind. And clarity of mind can be found in the most surprising of places. Even the 840 bus to Whitby.